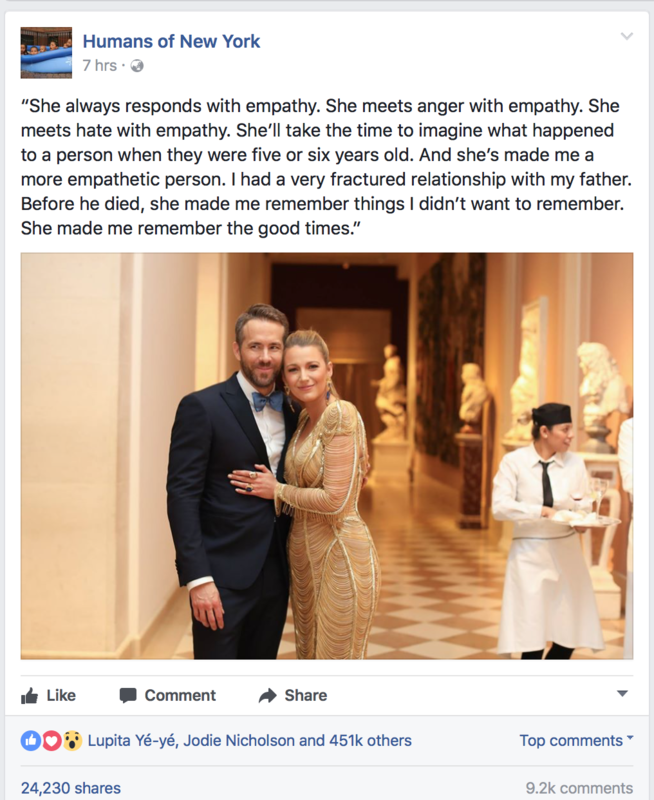 When popular Facebook page Humans of New York cornered stars on the Met Gala red carpet, asking them to spill the beans about their lives, Ryan Reynolds said wife Blake Lively made his a whole lot better. Obviously that phrase “relationship goals” is used WAY too often, but when it comes to this couple – who are parents to two little girls – it genuinely seems to be warranted. Not only do they seem supremely happy together, they seem intent on doing the hard work required to be great humans – and taking nothing for granted. They spend a lot of time expressing their appreciation of one another, balance the privacy of their children with their media obligations AND constantly seem to be reaching for growth rather than resting on their celebrity laurels. It’s all pretty impressive. When interviewed, they generally outline each other’s strengths, touch on personal challenges and broach meaningful topics that make the most of the air time they’re given. It’s not often that carefully managed A list stars push beyond the usual ROTE script and standard piffle to utter something genuine, inspiring and motivating. It’s kind of compelling when they do. Not only did he dive deep and talk about something that was obviously really painful, he talked about holding onto anger and how Blake helped him find a way to begin resolving some pretty complicated feelings about his dad. Genuinely big and meaningful, practical stuff. These are very relatable struggles and his “remember the good times” and “empathy first” reveals are approaches we can all use in our own lives. Basically he took his moment on the red carpet to reflect something great back onto his cute wife – and all of us. Remember the good times, indeed.